Formation of the primordial follicle occurs in the first stage of folliculogenesis, and involves individual envelopment of oocytes that survive the process of germ cell cluster breakdown by a single layer of squamous pre-granulosa cells. 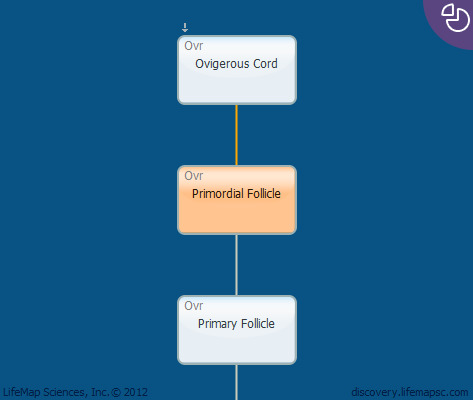 Preantral (primordial, primary and secondary) follicles begin to develop prenatally in humans and postnatally in mice. In both mice and humans, preantral follicular development does not require stimulation by the pituitary gonadotropins. By the secondary stage, an additional layer of somatic cells (theca cells) forms outside the basement membrane of the follicle. Estradiol and progesterone may partially inhibit primordial follicle formation in rodents, while NOTCH signaling promotes it. In human: Primordial follicles are formed during the 20th week of gestation and populate the ovary before birth, forming a reserve of follicles for life.